"Ms. Bryant was born in Barnsdall, OK in 1940 and graduated from Tulsa's Will Rogers high school in 1958. 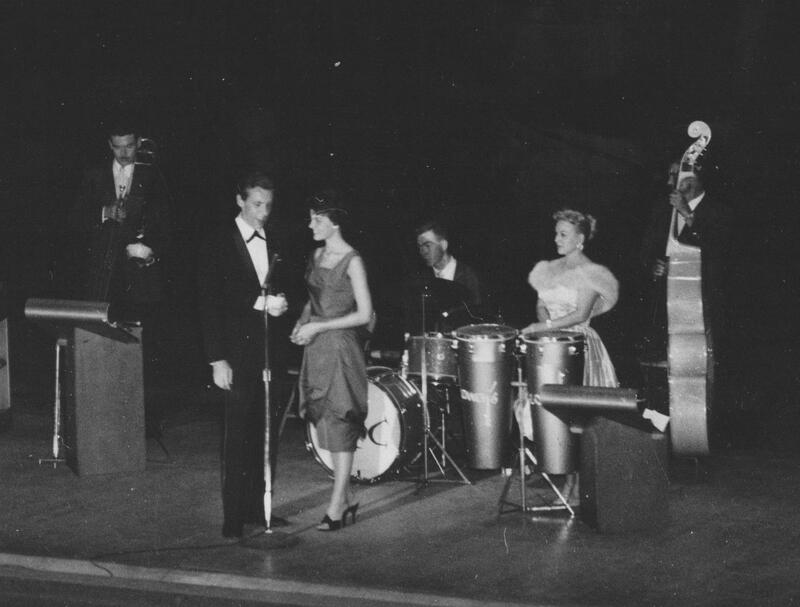 She went on to become Miss Oklahoma in 1959 and pursue a successful recording career. I used to play her records on Tulsa radio stations." Wikipedia entry for Anita Bryant. Prompted by Chew's review, I've gathered here comments from the Guestbooks/GroupBlogs about her early, uncontroversial days in Tulsa. For a good narrative account of her career, read this entry at Ron Enderland's IRememberJFK.com. "Through the years KOTV has sent many graduates from Tulsa to broadcasting centers across the nation. 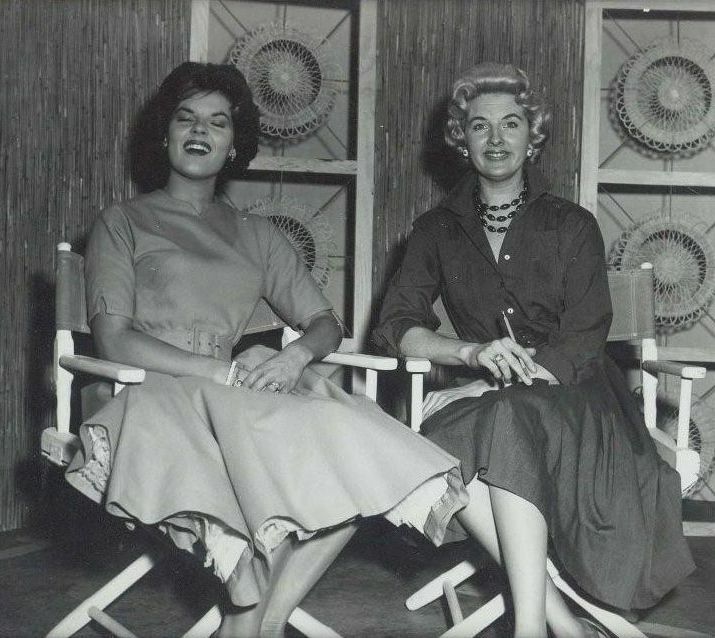 Singer Anita Bryant made her debut on Channel Six as did Louise O'Brien, who transferred her popular afternoon woman's show to CBS in New York. The News Department of KOTV has lost the services of Jim Ruddle and Harry Volkman to Chicago audiences. Two other alums of Tulsa television now in network capacities are Roger Sharp with ABC in New York, and Jim Hartz, who has a nightly newscast on NBC in New York City." A lot of people were in Anita's life to help get her started. I was there as the fashion coordinator, who called upon designers over the USA to provide her wardrobe. Full page photos of her were mentioned by the AP as being the most outstanding in Atlantic City. A little feather in "T" town's hat. Louise, 4/19/2009: "Anita on the TV set with me prior to broadcast on KTUL in the early 60's. She was practicing the song as we were getting the TV set organized for 'air-time'." I mentioned Marna Bryant in an earlier post. An interesting sidebar is that in the mid-fifties, a young (teenage) girl came to the station a couple of times and sang. Her name was Anita Bryant. Marna became friendly with her, although no relation that I know of. When Arthur Godfrey's Talent Scouts came to Tulsa, Marvin Lawill, a cameraman at KOTV and Anita both auditioned and both were accepted. Marvin was overjoyed, as was Anita, however, she had a problem. Her family was very religious and strictly so. She wanted to go on the Godfrey show, but her parents thought not. Marna went to their home and talked to them, telling them that Anita had a God-given talent that should be shared. Eventually, they conceded the point and Anita went on to great success. Had it not been for Marna, Florida might have stopped selling orange juice, and gays everywhere would have been more relaxed. Marvin, by the way, never had a career as a singer and unfortunately died a few years ago. At the time, he said I was foolish not to audition for the Godfrey show, but I knew better. 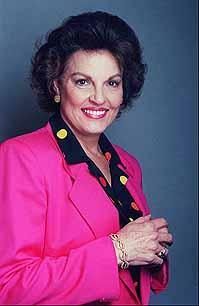 When I was at KVOO radio, Anita Bryant would occasionally sing there and her singing talent was obvious. I've tried to locate her re: the KOTV reunion, but an Internet check shows that the Anita Bryant Theater is now the Moe Bandy Theater and I've had not response from there. Any help? Let me tell you my Anita Bryant story. I was operating the Newsmobile at KRMG in 1956 when I arranged to do an interview with her and play her first record. Still in high school, she was a little on the plump side with a not-so-perfect complexion. Yet she was attractive, and seemed to be on the verge of blossoming. Mainly, though, she had a wonderful voice. After the interview I asked her if she was planning to enter the impending Miss Tulsa contest. She said that she wasnt because displaying herself in a bathing suit (even those awful 50s things with their modesty panels) would be against her religion. I explained to her the doors that such a contest would open up to her if she won. I told her about the opportunities which came to my two friends Shirley Barbour and LoRene Washburn who had won the Miss Oklahoma contests only three and four years previously. Anita said that she would consider it. She did. She zoomed. I first heard Will Rogers student Anita Bryant when she sang in "South Pacific" on the Edison High school stage. That comment about a non-approval for KOTV (of future Broadway star Susan Watson) reminded me of a time when Anita Bryant was to appear on KVOO. I alerted a Capitol records rep about her appearance...and later he said he tuned in but didn't note anything special about her. Maybe I told the wrong guy. We (at KAKC in the early Top 50 days) also as a promotion backed Anita Bryant for the Miss Tulsa contest. She won that and we sent two busloads of listeners to Oklahoma City for the Miss Oklahoma contest, which she won. She later, of course, ran for Miss America and was assisted by Don Cherry's (the recording artist) wife, who was a former Miss America. She was a runner-up, and her career went from there. Lee Woodward, Anita Bryant & Honey Hudgen. Click to enlarge. I read in a guestbook about Anita Bryant and her appearance in high school. When she and I hosted the TV world premiere of "New York Confidential" at the Brady Theater, she was most attractive and thin! I suppose she was about to be or had just been in the "Miss America" contest. 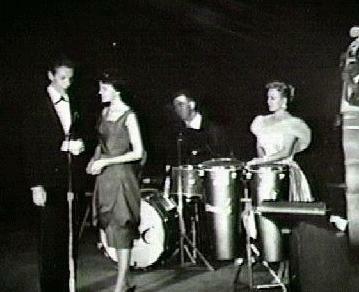 The lady to the right was the popular music leader, Honey Hudgen. The noted gossip columnist Earl Wilson was in for this event. He asked me for a tidbit. I told him to just go to the Avalon Steak House about three in the morning, and he would be rewarded! For many years my source of old LPs and books has been the Goodwill store on Southwest Boulevard in the old Stockton's building. This past weekend I found two Rogers High School Lariat yearbooks in the store. They are from 1955 and 1956 and cost $15 each. The 1956 yearbook contains the sophomore picture of a pretty 15-year-old Anita Bryant. The Rogers Ropers yearbooks!!!! Cool, my sis was a 1959 WR grad. One of her yearbooks, maybe '57 or '58 was too cool. It had a section on everyone in the music program. In it, my sis Sharon Kay Thayer (choir) Anita Bryant (choir) David Gates (of Bread, violinist and choir president) , Elvin Bishop ("Fooled Around and Fell in Love"), and Leon Russell (Russell Bridges). 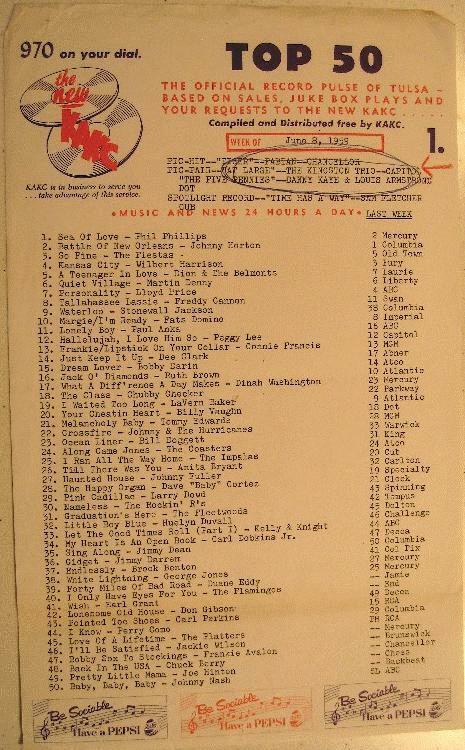 I see that Tulsa's own Anita Bryant had the #26 spot, with "Till There Was You." Quintessential tiki tune, Martin Denny's version of "Quiet Village", is up there at #6. 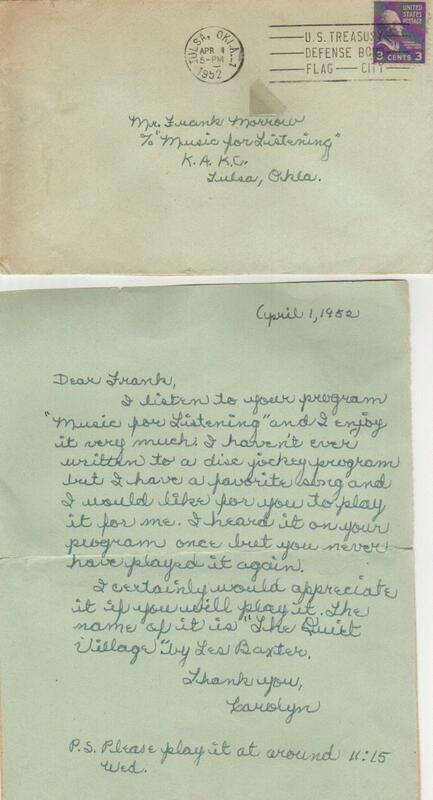 Contributor Frank Morrow's first fan letter at KAKC, dated 4/1/1952, was a request for composer Les Baxter's version, which (we believe) was the first Fantastic Theater theme.